Native bushes, trees and seeds were planted after system installation. Mountain Creek flows through the community of Red Bank, Tenn., to the Tennessee River. The Tennessee Department of Environment and Conservation (TDEC) has identified it as a 303(d)-listed stream, which means its pollution exceeds the state’s standards for one or more water quality criteria. Habitat alteration and sediment have been identified as the main pollutants and are due in part to channel erosion caused by urban development and increased storm water runoff. Previous studies conducted on the Mountain Creek watershed have indicated that erosion of the Mountain Creek stream channel is estimated to be between 66% and 81%. A severely eroded section of the creek was jeopardizing the structural stability and safety of an access road and an outdoor natural classroom at Red Bank Elementary School. The purpose of this project was to reinforce the creek bank, stabilize and armor the slope leading from the school’s access road to the creek, improve water quality in the watershed, and protect the school’s outdoor nature classroom. This restoration project was spearheaded by Tenne-SEA (Student Environmental Alliance), a Chattanooga, Tenn.-based organization that collaborates with communities to teach children about their connection to nature. Students from Red Bank Elementary also played a part by participating in the “Stream Team.” The program teaches students about the natural world by using real-world problems while determining environmentally friendly, sustainable solutions. Students learned about watersheds, flooding and water quality. Students had the opportunity to shadow engineers and were included in engineering design and construction oversight. Because of the project’s location, multiple units were connected and contoured to fit the embankment. EC Design, an erosion control modeling system that meets Hydraulic Engineering Circular No. 15 design criteria, generated an in-depth hydraulic analysis of the stream bank. A geotechnical review using Slope W also determined that a combination of Armormax and Scourlok systems would be installed along 105 ft of stream bank and the slope above it to stabilize the embankment and protect the toe of slope from future scour forces. Scourlok provides bank stabilization and scour protection. It was designed for projects like Mountain Creek that need scour protection at the toe of slope in addition to slope stabilization and erosion control. Its design features rigid cells armored with erosion control protection from Pyramat high-performance turf reinforcement mat (HPTRM), as well as the separation capabilities of Geotex nonwoven geotextile. Prior to construction, a pump was installed to divert water into another section of the creek during the construction phase. The eroded stream bank’s foundation was excavated and stabilized using a combination of nonwoven geotextile and stone. The scour protection system was selected for its design flexibility. This was important for the Mountain Creek project because the installation location was at a bend in the stream, requiring multiple units to be connected and contoured to fit the radius of the embankment. Two tiers of units were installed for a 100-year flood event. The top tier was offset from the bottom row, and the entire installation was staggered horizontally due to site conditions and equipment access needs. Once installed, the bottom units were filled with backfill and stone for normal flow conditions. The top row was filled with in-situ soils to minimize the amount of fill shipped to the project. This reduced the material and transportation costs and minimized the project’s overall carbon footprint. 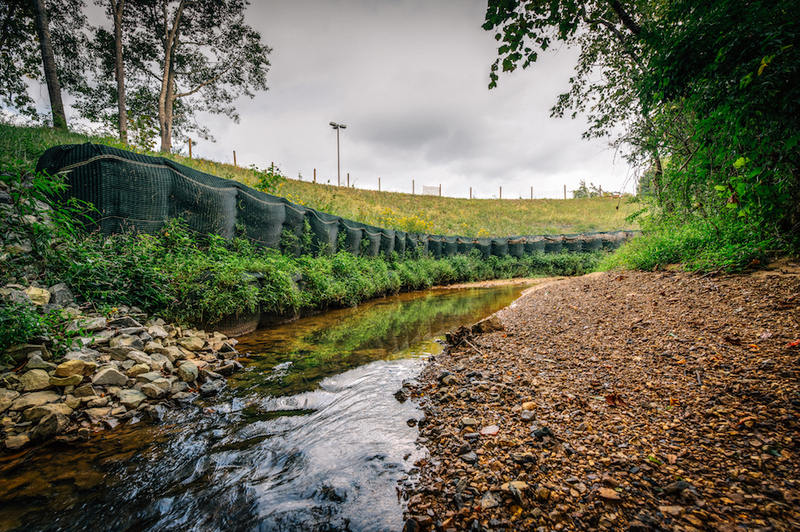 Additionally, Armormax was installed on the slope above the scour protection system to stabilize the upper stream bank and prevent future erosion. The system resists both hydraulic and non-hydraulic stresses, which means the site can be maintained by mowing and other landscaping equipment without fear of damaging the HPTRM. The slope stability system and scour protection systems promote rapid root development and encourage vegetation growth. In the final phase of the project, native bushes and trees were planted directly in the slope stability system, and seeds were applied throughout the entire application. Both systems qualify as best management practices in compliance with NPDES requirements. The bottom units were filled with backfill and stone. Construction began December 2017 and was completed January 2018. Ultimately, the project successfully restored and stabilized 105 ft of stream bank and the above slope, protecting Red Bank’s access road, preventing additional sediment from being deposited in an impaired watershed, and providing a safe outdoor nature classroom where students can continue to take part in creek restoration efforts. Since the project’s completion, the stream has restored itself to its original channel depth. This has resulted in the formation of pools and riffles, which has led to several fish and minnow species relocating to this section of the stream. Prior to construction, there were almost no fish in this area. As a result of the increased fish population, a family of otters has been observed near the site. Additionally, wildflowers and other native vegetation have emerged along the slope, attracting several butterfly species. The stream bank and above slope were successfully stabilized and restored. Stream Team students shadowed engineers on the project. Lee Pierce is vice president of engineered systems/market development for Propex Global. Jeff Hoilman is market development manager for Propex Global. Pierce and Hoilman can be reached at [email protected] or 423.553.2465.